Did Corsets Harm Women’s Health? 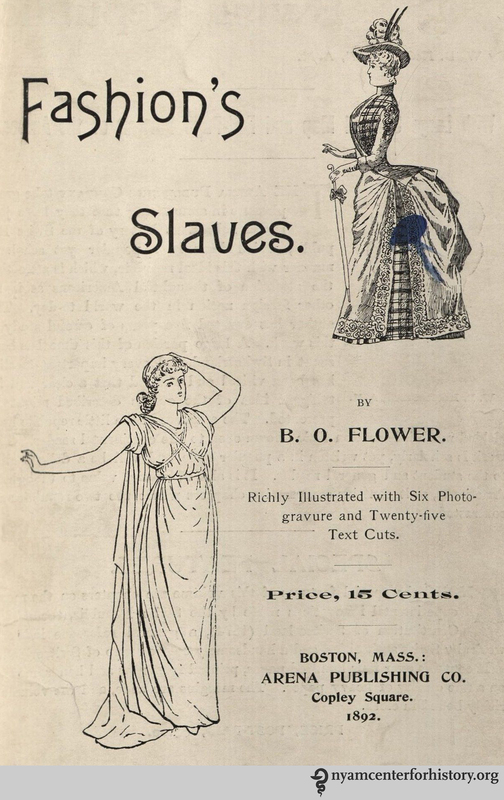 The title page of “Fashion’s Slaves,” 1892. Click to enlarge. Certainly, many women felt fettered by their restrictive clothing or there would never have been a dress reform movement. But just how damaging were corsets? Click on an image to view the gallery from Le Corset. Plate II: Life-size X-ray of a front-closing corset (rear view). In O’Followell, Le Corset, vol. 2, 1908. Plate I: Life-size X-ray of a straight-line corset (rear view). In O’Followell, Le Corset, vol. 2, 1908. Radiographic plates I and II, superimposed. A. Hourglass corset. B. Straightline corset. C. Waist formed by the front-closing hourglass corset. D. Waist formed by the straightline corset. In O’Followell, Le Corset, vol. 2, 1908. Fig. 26: Female torso with corset. Fig 27: X-ray of a female torso without a corset. In O’Followell, Le Corset, vol. 2, 1908. Dr. Warner trade card, inside and out. An 1883 article from Godey’s Lady’s Book and Magazine hailed Dr. Warner’s Coraline Corset as a model of comfort, superior to whalebone and horn corsets, and endorsed the model as a substitute for tight-laced models: “They have demonstrated that tight lacing is not essential to grace or beauty of form; and while impractical dress reformers have been preaching reforms which no one would adopt, Warner Brothers, by introducing properly fitting corsets, have given practical aid to the health and comfort of several million ladies.”8 Click to enlarge. Many of the doctors against tight lacing, including O’Followell, did not condemn corsets as a whole. Instead, they championed designs less tightly laced. Several pamphlets in our collection feature what they claim to be medically sound corsets. Incorrect and correct pressure applied by corsets. 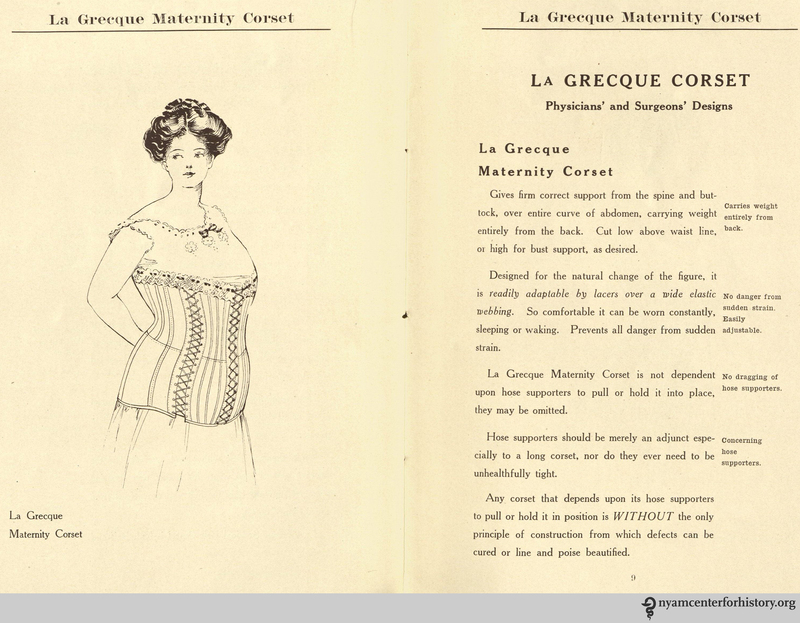 In van Orden Corset Company, “La Grecque Corset as an Aid to the Physician and Surgeon,” circa 1911. Click to enlarge. La Grecque Maternity Corset. 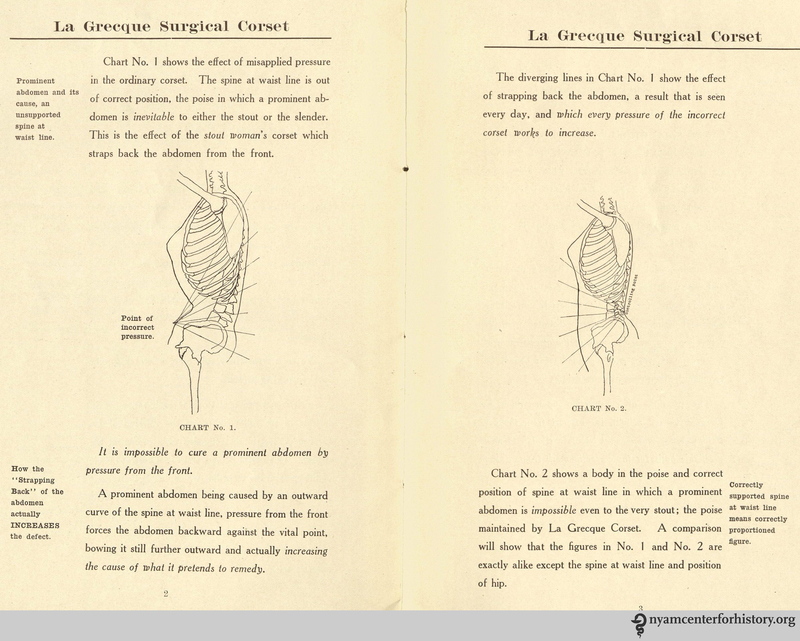 In van Orden Corset Company, “La Grecque Corset as an Aid to the Physician and Surgeon,” circa 1911. Click to enlarge. Figures 5 and 6 in H. W. Gossard and Company, “Corsets from a Surgical Standpoint,” 1909. Click to enlarge. 1. Flower BO. Fashion’s slaves. Boston: Arena Pub. Co.; 1892. 2. Starr M. Vintage X-rays reveal the hidden effects of corsets. CNET. 2015. Available at: http://www.cnet.com/au/news/vintage-x-rays-reveal-the-hidden-effects-of-corsets. Accessed May 14, 2015. 3. O’Followell L. Le corset; histoire, médecine, hygiène. volume 2. Paris: Maloine; 1908. 4. Davis L. No, corsets did not destroy the health of Victorian women. io9. 2014. Available at: http://io9.com/no-corsets-did-not-destroy-the-health-of-victorian-wom-1545644060. Accessed May 14, 2015. 5. LOFT: Size Chart. Available at: http://www.anntaylor.com/catalog/sizeChartPopup.jsp. Accessed May 18, 2015. 6. Gap – women’s size chart. Available at: http://www.gap.com/browse/sizeChart.do?cid=2081. Accessed May 18, 2015. 7. Klingerman KM. Binding femininity: An examination of the effects of tightlacing on the female pelvis. 2006. Available at: http://etd.lsu.edu/docs/available/etd-04072006-115441/unrestricted/Klingerman_thesis.pdf. Accessed May 14, 2015. 8. Coraline: Its discovery and use in the manufacture of corsets. Godey’s Lady’s B Mag. 1883:468–469. Available at: https://books.google.com/books?id=nXA-AQAAMAAJ&pgis=1. Accessed May 18, 2015. 9. Schwarz GS. Society, physicians, and the corset. Bull N Y Acad Med. 1979;55(6):551–90. Available at: http://www.pubmedcentral.nih.gov/articlerender.fcgi?artid=1807654. Accessed May 14, 2015. 10. La Grecque corset as an aid to the physician and surgeon. New York: van Orden Corset Co.; 1911? 11. Summers L. Bound to please: A history of the Victorian corset. Oxford, New York: Berg; 2001. 12. Corsets from a surgical viewpoint. Chicago: Gossard Co.; 1909. 13. Fontanel B. Support and seduction: The history of corsets and bras. New York: Abrams; 1997. This entry was posted in Collections, History of medicine and tagged Benjamin Orange Flower, corsetry, corsets, Corsets from a Surgical Standpoint, dress reform, fashion, fashion history, Fashion's Slaves, health pamphlet, La Grecque Corset as an Aid to the Physician and Surgeon, Le Corset, Ludovic O'Followell, tight lacing, trade card, waist size, women's health by nyamhistorymed. Bookmark the permalink. great article – I linked it to my own about busting corsets myths- hope you don’t mind!